Google Keep is my go-to app for writing short notes and setting reminders for myself. I've also used it as a mindmapping tool from time to time. Today, Google Keep for Android got a huge update. You can now draw notes in the app. To draw a note just open the app and tap the pen icon to start drawing. You can also add a drawing to a text, image, or voice note. To add drawings to an existing note tap the three dots in the upper-right corner of the screen and select "add drawing." 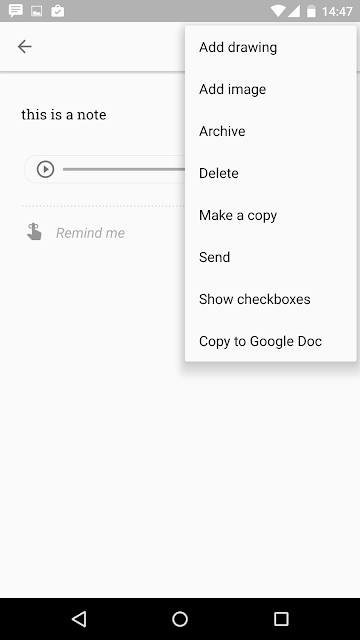 Google Keep is a great app for creating to-do lists and reminders. Google Keep lets users share notes just like sharing Google Documents. In that regard it's great for keeping track of to-do lists in team projects.